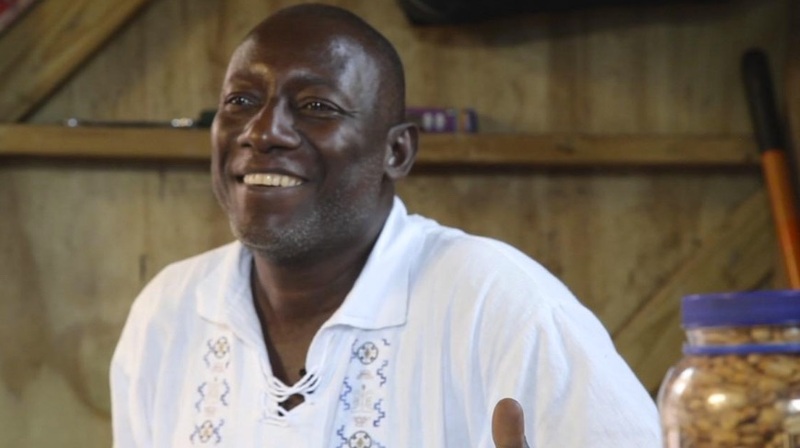 An interview with a Haitian peanut butter entrepreneur — Poverty, Inc.
Haitian mamba entrepreneur Paul Ducarmel prefers Haitian-grown peanuts to the subsidized U.S. ones dumped on Haiti in the name of free trade and food aid. There was a time in the not-so-distant past when a U.S. food aid shipment of 500 metric tons of peanuts to feed 140,000 Haitian children would be celebrated without question. Times are changing. While the gesture may be well-intentioned, this program stands to become the latest in a long history of U.S-sponsored programs that have destabilized Haiti’s agricultural sector, driving the nation further into poverty while increasing its dependence on foreign aid. Peanuts play a central role in Haiti’s economy and are a critical foundation of its food security and food sovereignty. The Haitian Platform to Advocate for Alternative Development (PAPDA) reports that 150,000 Haitian farmers currently produce 70,000 metric tons of peanuts annually. 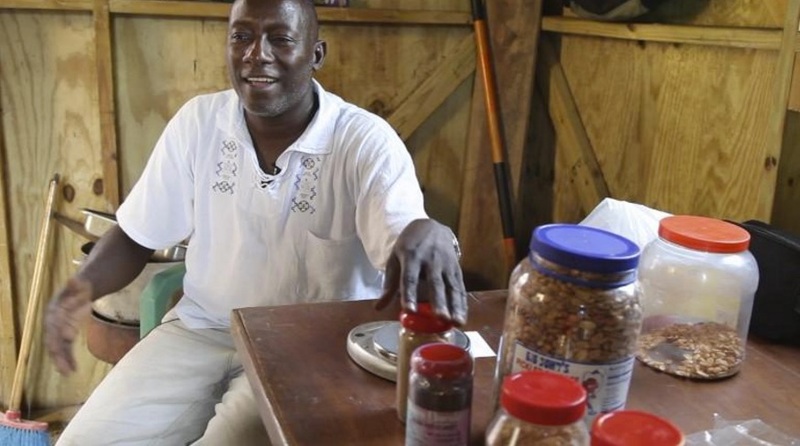 There is a long chain to transform peanuts into mamba, or Haitian peanut butter, and “a conservative estimate would lead us to conclude that this is a sector which is a regular source of income for more than half a million Haitians most of whom are women. Peanuts are just the tip of the iceberg. Historically speaking, rice is among the most famous agricultural examples of the destabilizing effect of U.S. industrial stimulus programs masquerading as international altruism. "Agricultural subsidies are a huge distortion for world markets, particularly the poor," says Marcela Escobari, director of the Center for International Development at Harvard, alongside Andreas Widmer and other voices in the film. "They happen because local interests want to protect their markets, and they do that at the expense of other countries that don’t have the same power to negotiate the bilateral agreements with large powers like the U.S."
Talk to a Haitian rice farmer (or any Haitian for that matter) and you'll get the human side of this economic problem. "That situation completely destroyed us," rice farmer Jacob Donatien told us during our 2012 visit. "The crops are not only intended for our personal use. They are also intended for the market. Once the market is flooded, there is no more demand. As a result you lose the work of a whole year." Former president Clinton, to his credit, has spoken out on this in the past. Here he is testifying before Congress on "the lost capacity to produce a rice crop in Haiti." Since 1981, the United States has followed a policy until the last year or so we started rethinking it, that we rich countries that produce a lot of food should sell it to poor countries and relieve them of the burden of producing their own food, so thank goodness they can leap directly into the industrial era. It has not worked. It may have been good for some of my farmers in Arkansas, but it has not worked. It was a mistake. It was a mistake that I was a party to. I am not pointing the finger at anybody. I did that. I have to live every day with the consequences of the lost capacity to produce a rice crop in Haiti to feed those people, because of what I did. Nobody else. Despite President Clinton's testimony, history continues to repeat itself. At least this time we are starting to take notice. This is great coverage. We'd like to add a Haitian voice to the discussion. 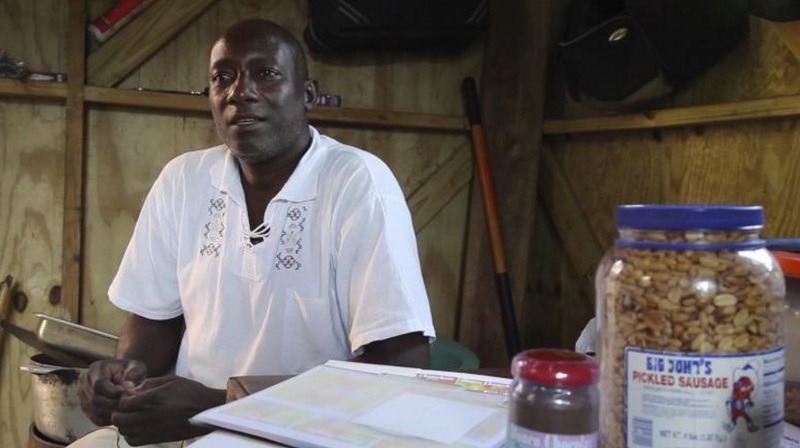 On our production trip to Haiti in 2012, we had the pleasure of interviewing a gentleman named Paul Ducarmel, a mamba peanut butter entrepreneur. Below is the full transcript of that interview. In the fifth section, he speaks specifically to charitable donations of peanut butter. Meet Paul Ducarmel, founder of "Douco"
MICHAEL MATHESON MILLER, DIRECTOR OF POVERTY, INC.
Hello, hello! Paul, good to see you. Hi, sir. Remember, we met the other day at the thing. So, how long have you had this shop? Well, I’ve been here for about a year. I’ve been here for about a year, but the shop has been here longer than that. How long is the business? My business is a chocolate factory. It’s a small enterprise that was started in 2003. What propelled me to enter into this enterprise, I have lots of reasons. I started making chocolate first. Since I was small, at my home, I lived in the backyard and I was the one to always prepare them. Usually, I made them into balls. You would mash them and form balls. But, as God has granted each person their temperament, I realized that people were responding with a question to which they already knew the answer. This is what propelled me forward at one time. Also, I learned a trade and I wasn’t working. Then, I was looking for something to do and then I thought of trying to make it into a powder. When I finished making it into a powder, I said “Wow! This is something that I can market!” This is how it came about. Because I always like something different. Every other country creates it in balls. Me, I, wanted to present something that was different. I finished preparing cacoa, chocolate and there were people in the area. I decided to tell them. I’m working on a project to make chocolate. When I finished making it, I went all the way the way to the downtown street. I presented it to people that I had already spoken to. I told them here is the product I said that I was making and some people made purchases. Then, I started with three bushels. Following that, I’m selling chocolate, selling chocolate, but I became – when I was a child, as well, they used to make chanm chanm at my house. Then, I said, let me trying making another product. This was how I started making chanm chanm. But, the difference between the chanm chanm and the chocolate products, the chanm chanm – I’m not saying that only Haitians make it – but it’s not a product that is known world-wide. But, chocolate, people know of that, everyone knows of it. For this, I had the objective of making it a product that most countries would know. This is my real purpose. The chanm chanm. That’s why I can tell you that I am the largest chanm chanm producer in Haiti because lots of markets did sell chanm chanm. I was the one that brough chanm chanm to them because it’s not some thing - most of the markets are foreign, so they are not accustomed to this type of product. Like DeliMart – I remember - they bought chocolate, but didn’t want to buy chanm chanm. Once time, I took a bottle of chanm chanm and gave it to the lady as a gift. The same time they saw it, they asked me to give them two dozen. If I didn’t have it on hand already. It was two years before they sold chanm chanm and now I compelled them to sell it. And actually, I used to give them little bottles and now they are in these bottles and those bottles. Both types sell because I am trying and trying to think of the development of the business, as well. For the business to develop, for me to further business growth, I need to sell more, so I can have more clients. And that is the objective that I have set. Afterwards, I started making peanut butter, as a third product. From peanut butter, I was working. We made peanut butter and tried to sell it in the city and then we tried to have two or three clients in Port-Au-Prince, as well. As the last product – we’ll I not saying the last – we make grilled peanuts, as well. And in December, DeliMart made a request and it wasn’t for any of the types of products that I was accustomed to selling. It was for – they asked me for – ginger, for cloves, cinnamon, star anise, whole cloves. Now, I prepared myself for that. I sold them and I can say that that was the first time with this request that I had a bigger, that is to say, a larger volume that I sold to one place because they brought a substantial amount from me. That made me very happy and that’s why the projections I had for this January because in the first six months of 2012, I would like to attain a level of business growth of 20%. As of December, I had already attained that. This is why I’m working hard to see if I can maintain it and go further. It contains corn, it contains sugar, it contains salt, it contains ginger, it contains peanuts. Pardon me, but if I can give you an idea… This is corn that we grilled so that we can make chanm chanm. Do you mostly make peanut butter? When I first started, chocolate was number one. Now, chanm chanm is number one. Describe all of your processes to come about doing all of this. How did I get to selling to the markets? Well, usually when someone is producing, you’re not working with someone, you decided to become self-employed. You are a producer, usually when you’re a producer, you have to sell to other people. You look for products that people may need. For example, I know that people are interested in these things, and these are what I have chosen to make and I was raised with these. I was raised at home where they used to make chocolate. They made chanm chanm by grinding it in a mortar. I used to also make grilled peanuts when I was little. You see, I can say that. I can do all of that. If you are operating a business and you would like to go from one scale to another, so that means you have to strive to have as many clients as possible. That is to say, that everyone that purchases from you is your boss. For instance, the difference between when someone goes to apply for a job somewhere, you have one boss because that is the person who pays you. When you are a producer, now you can decide that you will have 100 bosses. Everyone that purchases from you, brings you money and pays you becomes your boss. So, if you have 100, 200, whatever the case may be, you are trying to work, which is why I said in my first text which I mentioned to you, “[French] if you would like to enjoy greater comforts, why not work harder?” That’s my chapter, which means that if you are looking for a certain kind of material comfort, you have to work. You have to be able to offer something and search for as many clients as possible: 500, 1,000, as many bosses as you can find, so you can say that clients are your bosses because they bring money to you, in the same way a boss pays you. Well, I, actually have two people working for me, but I would like this number to increase because as it was always said that American President said "never ask the country what it can do for you, but what you can produce for your country?" It is in this same way that I can say also, that I have two people working with me. If I could reach a level of production that would double, triple, quadruple that, it would be better for me because I could see that I, in my own sphere, was able to contribute to the development of the country. Because I don’t want to wait on the State to do something for me. I need to handle it myself. Challenges of running a business: Distribution, Foreign competition, High peanut prices. Typically, when I first started, business was slow. I would say that when I first started, I sold my first local peanut butter to Eagle. I used to supply Eagle. Every Monday, they would get 48 jars of peanut butter and sell out. Then, a problem arose. I have clients here and in Leogane, too, but I there was a store on the airport corner to whom I used to sell peanut butter, too. I think there was two markets in Port-Au-Prince to whom I used to sell peanut butter. Then, I stopped because it wasn't easy for me. Peanuts were going up because as I just explained a moment ago, you can start by buying the bushel at $30 and it ends up selling for $50. Then, it becomes more difficult. I realized that I couldn’t maintain. Then, I stopped. When I stopped, they found others and now they mostly sell foreign peanut butter. They barely sell my . Afterwards, I continued to work only around here because it was difficult for me, as well, transporting 48 pounds. For instance, when you get out of the car with less than 48 pounds and then have to walk further down to take a car to get to . Actually, this is the problem that I encountered. Sometimes, I have 72 jars of peanut butter to deliver someplace. Imagine yourself that you have to walk 100 meters with 75 pounds. Right now, I supply the clients here with peanut butter only. Now afterwards, I still need to grow, because I don’t want to want my business affairs to diminish, so I tried checking out the DeliMart. I tried checking out the Clairesine DeliMart. Those DeliMarts sell peanut butter. Apart from that, I have peanut butter clients here, too, big peanut butter clients, that purchase $2,000 worth of peanut butter from me at one given time, , in total. I can say that this is my biggest client. That is to say, I stay with the peanut butter. It's not on my basic product list, but I still make it because there are times when I provide products – all of a product - to the market and then I need to stop. When I have more and more products, that means I will never stop. Even if I give that one, I could have a client that needs peanut butter. I could have a client that needs something. Right now, I have two new peanut clients. I haven’t gone to Port-Au-Prince with the peanuts yet. I used to supply two places here. Now, during this week, I have two new clients, for Leogane only. Other times, I have to try to work on how because I can’t go into Port-Au-Prince with it because I wanted to improve the peanut packaging. Now I’ve got the formula, so I can try to find two or three clients in Port-Au-Prince. Why is it expensive to make it locally? On Haiti as the Republic of NGOs: Some good, some bad. Yeah, good. Let me ask you: at the meeting with Daniel, we also talked about the, all the, , somebody told me, somebody told me that they call Haiti the Republic of NGOs. Right? All these NGOs are in Haiti trying to help. Do you think that they are helping? Are they hurting? Are they doing good? What do you think? The Republic of NGOs, it’s true, especially, for example in Leogane. There is no lack of NGOs. But, insofar as what this brings to local development, well if they were saying that you come - want to help me develop myself or the community. But if after one year or two years, you don't see the community going from point 1 to point 1.5 on a development level of 1-10, then most likely, it is true that funds did arrive. However, how they managed these funds or what they used them, I can’t say it’s not helping the community, but to sum it up, I can say according to what anyone has seen here since the beginning, would you say that the development matches the amount of money that has entered Haiti for the past 2 years? You can ask yourself that question. You can answer it to see for yourself. But, for me, my impression is that we are familiar with a certain level of development apart from the NGOs that are in Haiti and furthermore, you search for someone’s well being. People never help you search for your own well being. I can’t condemn them all, because there are some, let me tell you, after my business was struggling. For example, in December before January 12th, I had a good selling period. I was making projections of how much money that I had out and I had money that was rolling and I said that I would forget that money and that I would work with this to see how I would further myself. January 12th arrived. There were some payments that I received six months later. But the business had to continue. Not only did I receive some payments six months late, but I was doubly hit because I lost some clients. Needless to say that business slowed down. There was an NGO that came out here to give a training. I don’t know how they found me. Perhaps they saw my products someplace because they were looking for people like that and then I noticed that someone came to the house. They came and said, “Sir, we’ve seen your products and we were interested in helping people involved in production, young entrepreneurs, so we want to work with you.” In fact, they provided me with training and then they made it possible for me to receive a fund. I can say that up until this moment, I’m at a level in this business that is attributed to that fund. This means that I can’t say that a number of funds aren’t being channeled properly. Regarding the NGOs, one can say that nothing is perfect, but nothing is completely bad. This means that if there are some managers that have a vision, they can put their heads together to try to do things that will further help development for the communities. Paul’s take on charity drives that ship peanut butter into Haiti: it’s a commendable intention BUT it hurts local production. When we were at the meeting, we were talking yesterday – the other day, one second – when we were at the meeting this morning we talked, we were asking about the question of how sometimes that foreign aid or the charity has sent in peanut butter. We heard about one church that sent in 28,000 jars and another church that sent in, I think, another 100,000 jars of peanut butter to give away for relief for the Haitian people. Now you've been making peanut butter. Has that had any effect on your business? Yes. For example, we are living in a country where there is a lack of employment. If I received a request to provide even 1,000 jars. That doesn’t mean that I can provide 28,000 because I don’t have the things for that. I think there would be a positive impact because I can help others. If I had someone else working with me, I would hire one or two more to work with me. These people could receive a salary that would allow them to survive. There are plenty of people in the country asking for things now, because they don’t have anything to do. God doesn’t grant everyone the same opportunity to create. I didn’t have anything, so I created something for myself to do because I don’t like assistance and I don't want to depend upon someone all the time. But, not everyone has that ability. If in that 28,000, for example, I could make 500, that would benefit me and it would benefit a lot of other people, as well, because in Haiti there isn't enough employment. You come to see plenty of other companies that produce peanut butter. Even if they wouldn't buy all of it from me, they could check the entire country and they would find, they would find some. When 28,000 or 100,000 jars of peanut butter enter the country, it is a won or loose because those that used to purchase, if those people find another peanut butter, they will let 2 months go by without buying any and if my product is gone [sold] after a month, it will take more time to sell. There’s a video we have of this one guy at the church and his idea was people were sending down blankets or other things that Haitians didn’t need. He said, “Let’s do something smart for the Haitians. Let’s send down something they can use.” They got together, and they sent down thousands and thousands of jars of peanut butter. So here’s a man with a good heart who wanted to do something smart and so he sent down peanut butter, okay, because it’s nutritional. But, what do you say to that? Okay, how do you react to that? What would you say? Is that smart help? First, I would congratulate him because it was a good initiative. One part was a good idea. I could say that the intention was good. It was a very good intention. For the time being, as we have peanut butter products in Haiti. He could find different peanut butter producers and ask them how much they could give for the time being, according to perhaps how much it costs abroad per unit per jar and then he would see how both the producers and the people working with him - how they could all benefit from an such as this initiative to help people to get them some peanut butter to eat because we produce it here. It’s a country where people have peanut products, peanut butter. What can I say? The intention is good, but if through the intention, there could be a chance for producers in Haiti to deliver a certain amount of this, as well, for local conservation, this would help. Firstly, there are producers. It would help then. Then, if I had a large request for 1,000 jars of peanut butter, I would have to hire an additional 2 or 3 people to work for me. Those people would have another means to survive, but I wouldn’t say that the man doesn’t know that they produce peanut butter in Haiti… I would assume, but it’s odd for someone to think that a country doesn’t produce peanut butter, . If I said that, then I retract it. If that’s what I said, then I retract it because I think that would be odd. Paul watches the YouTube video of the Kentucky man’s peanut butter drive; the video has since been taking down. I’ll never forget the first time I went into Haiti. I think it was 2003. My wife - she was then my fiancée - went in together and I believe it was after a hurricane had taken place. I was with then Director of the Mission that we were partnering with and volunteering with, and we went to unpack a crate that was sent down on mission relief for the hurricane. He unpacked the crate and in there were blankets and food and and almost every piece of whether it be a blanket or food or whatever was damaged or wet. None of it was able to be used. As he sifted through it, he came to one of those boxes of 16, I think it was 16, boxes of peanut butters and he picked them up and he said to me, “if people only knew that they could send peanut butter and it would make our lives a heck of a lot easier.” That always stuck with me and the reason he said peanut butter – I look at him and I said peanut butter? He said packed with protein and you can drop it on the ground, it’s not going to break. You can throw it out to a guy in the street who can take it back and feed his family for a couple of weeks. It can be dropped in the water. It’s not going to be spoiled, can sit on the shelf, can sit in a container at the docks for weeks. It's not going to spoil, so a lot of people feel led to do a lot of things. Send money, send money. That’s what we’re hearing - send money. I have no disrespect to the large organizations that are helping the Haitian people, but there is going to be a tremendous amount of money that pours into that country. If you’ve been to the country and know anything about the country, I’m sure you’re asking is how much of that money will actually get to the people of Haiti. I don't have the answer. I really don't, but I felt led to do something. The mission that is located here in Kentucky has their headquarters in the northwest part of the country. I'm encouraging you. Buy a jar of peanut butter. Right on this site, you can buy one; you can buy 10; you can buy 100. Whatever the case may be, by a jar of peanut butter. We are going to physically take that money and we’ll update you on here and we’ll show a video – we’ll keep you posted. We will actually, physically, buy that peanut butter. We will put it in a container at the Northwest Haiti Christian Mission here in Kentucky and it will be shipped down to their mission in Haiti. Sounds a little crazy, sounds a little kooky, but I’m going to tell you something: this is going to go a long way to actually helping the people of Haiti. Here's one thing they're not talking about a lot on the news. Okay, Haiti is like a reverse C. Okay, Port-Au-Prince is down here. The rest of the country, pretty much is fed through Port-Au-Prince, so whether it’s diesel fuel or food – whatever the case may be – comes up through Port-Au-Prince, through the docks, through Port-Au-Prince, up through the cities to the other towns and villages and the people in the mountains. Because of this disaster, those other towns and villages will experience a tremendous downfall over the next several months. Their food prices will skyrocket. Getting fuel to power even the basic of hospitals will be very, very challenging. What are we going to do? It's a simple thing, but I believe it will have a profound impact. We're going to buy jars of peanut butter. We're going to put them on a container. We're going to see that they get up into the country. We’re going to see that they are where they need to be and they're going to go to feed families. Very, very simple. I ask you to do your part and I thank you for watching this video. It’s a tragedy that happened, but hopefully, one stupid little thing like a jar of peanut butter can make a lasting impact on a family and feed them and make them well. Thank you for watching and I hope you participate. The intention to help someone who is in distress is good, but living in Haiti, we produce peanut butter, as well. Think about it – it won’t be truly good for the people producing peanut butter in Haiti, because we make peanut butter here, as well. If there is a large stock of peanut butter coming here, then our production would decrease. People wouldn't buy our productions anymore, so there would be a profit loss. What can help a country to develop is the creation of jobs. 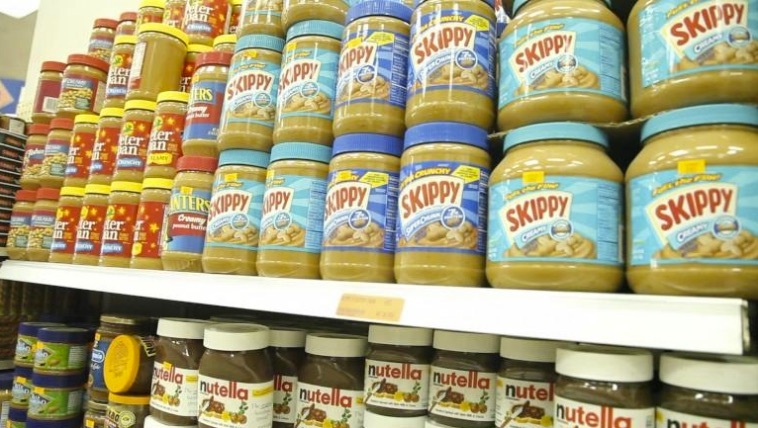 When there is a stock like this in a domain that we produce here in Haiti that comes into the country that will make people not buy the peanut butter that you’re producing. People that produce peanuts to buy, as well. Nothing will sell. It becomes unfavorable for us here in Haiti. The better thing would be for them to try and buy the peanut butter here, instead and they could distribute it. This would help. It would create jobs. It would be positive for the country’s development. Exactly! Because I produce peanut butter, as well. There are lots of others that produce peanut butter. When a stock this important comes into the country, that will paralyze production within a few months. I agree with you. I agree with you that we should encourage local production. It doesn’t allow job creation. If you could talk to that man, what would you say to that man? What would you tell him? To start, I would like to tell the man “thank you,” because he realized that there were people in distress and that he wanted to support them. I would like to thank him for that. I would also like to say, “In Haiti, there are quite a few people that produce a number of, a number of things that you can send to the people of Haiti as aid. For instance, I myself, produce grilled peanuts. I produce peanut butter, peanut butter. I produce chanm chanm. (39:00) And I make chocolate, as well. That means that when, when there is an amount of products that enter the country while there are people in the country that are producing the same products, this becomes, this becomes – it helps us in a sense. However, but for the people producing it, it acts as a recoil because it doesn't help the country in the development sense. I'm telling him that that the fact that he thought of us makes me very happy, but try to restructure his aid in a different manner because in Haiti, there are plenty of people who produce peanut butter. Plenty of people produce lots of other things like grilled peanuts, like chanm chanm, a very good product that comes from Haiti, from our soil. These types of things, they can find here to help the people. Then, it won’t be helping only those in need of aid, while another is undergoing a negative experience, but if it is here, a part or I don't know if you would buy this product. That would help a great deal with people producing within the country and it would help, it would allow more people find a means of sustaining their personal needs. Because it isn’t always when someone is always helping you. When you, yourself, are exerting the energy out there to work and this is what you do and the fruit of your labor allows you to eat, then you eat with more and pride. I would tell the brother thank you. This makes us very happy, the fact that he thought about us. But, also remember, that there are people in Haiti that are producing. That’s what I would like to say. Thank you. Paul discusses his family and providing for them through hard work. Yes, my wife is a nurse. And after she received her diploma, she went to study something else last year at a community center which enabled her ability to double. I have one child, a daughter named Bettyanna and my wife is named Betty. I tried other things. When I found this, I said "Wow!" I found the vehicle that I needed to create my path. Today, she hasn’t been working for almost a year. I don’t say that I live very well, but this is the only thing that sustains us. That's why I work very hard. Sometimes, I work 18 hours in one day so I can reach this point today. I write, as well. I write music, poems, songs in the same text that I mentioned to you earlier. I recited two, two from there and I am going to sing a song for you. What do you hope for your daughter? What are her dreams? What does she want to do? What do you want her to do and what does she want to do? Well, usually, there was a time when she wanted to be a teacher and then she changed her mind and said law or something, but she hasn’t made up her mind yet. I’m not here to impose something upon her. I must create the conditions for when she finishes her studies in about two years for her to find a means to do what she wants to do, so I can assist her with these needs. Paul shows Jerry and Jackie his equipment. Discuss the value chain and exploring his entire process with him. Betty gave me this equipment so I could peel peanuts, because I had problems peeling peanuts at one time, when I had purchased peanuts so I could grill them. As I work with cacao, as well, I find it more useful for me to peel the cacao after I have grilled it like the peanuts because the cacao can break. Whereas, the peanuts, once they break, they are difficult to grill. This equipment, 10 bushels of cacao that needed to be crushed in the grinder could take as long as 3 hours time. Now, with this equipment, 30-35 minutes is enough for me to process 10 bushels of cacao, peel it and resell it. This is a means that you can understand, as well and there are a number of entrepreneurs in the country, in various evolving fields. Sometimes, it is equipment that is required in Haiti. Peanut butter is an example. There are ways in which they can come into with these young entrepreneurs, so they can help them either through mentoring. That is needed to use to transform a number of products that can be more helpful to him. It will also be helpful to national production, as well. What will help a country develop? Local production and job creation - employment creation. If this possibility isn't offered to us, well, you can see that the country will not progress. This is why we are asking, if there is someone who would like to volunteer to help us, help the country. If someone is in business, then our preferred aid would be to help us create jobs because there are some people in the country that are working, working as volunteers and who can work, who have recreation centers. And if these people find a trade, they receive assistance so they can work and then we can see that there are more people that will benefit from employment, from a salary that will not have to depend upon aid. I will take this opportunity to say to Bernie, who was my mentor, thank you because what this equipment has helped me do, sir, I can’t even estimate because what used to take me three hours to do in this mill, in this mill for me to peel the cacao, this does it in 40 minutes and you see that in terms of opportunities, this provides me with a great advantage. I would like to say, thanks again, for this. We want to work with you to go through the whole value chain and visit the people that supply the peanuts and the cocoa beans, whether it’s the farmers or the market that you work with. We then go through the process of producing it here. Then where you sell the peanut butter, the local grocery stores and the local markets. But, I think it’s important that people in the U.S. and Europe understand the negative impact of just sending one jar of peanut butter, the negative impacts it can have on that whole value chain. These are the organizations who have signed the Open Letter to the USDA and USAID on planned peanut shipment to Haiti. World Vision is noticeably absent from this list, and noticeably silent on the topic as far as I can tell. represent the institutional views, if any of NYU. Newer PostThere's no such thing as a good orphanage.